WW1 WWI & WWII BRITISH ENFIELD SMLE NO.1 MK.3* OR NO1 MKIII* NO.1 MK.3 STAR .303 BRITISH, CIRCA 1916. 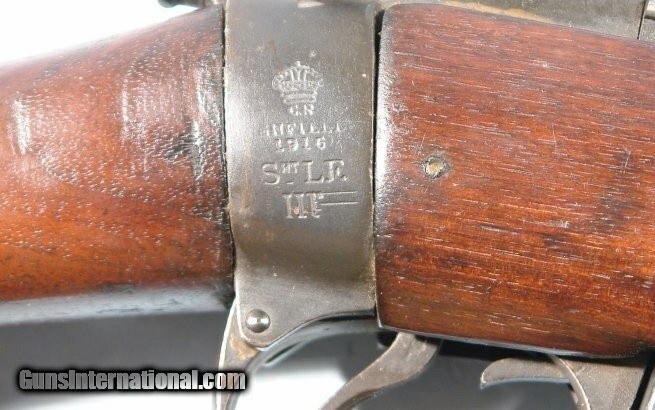 WW1 WWI BRITISH ENFIELD SMLE NO.1 MK.3* OR NO1 MKIII* NO.1 MK.3 STAR .303 BRITISH, CIRCA 1916. Made at the Royal Small Arms Factory in Enfield. NO import marks. Early bolt knob. T prefix 4 digit serial number with "England" stamped above it. Various wood repair inserts typical due to longevity of service throughout the 20th century. Correct crown proofs/inspectors marks everywhere as well as Linley & Co. box magazine. Matching muzzle cap/bayo lug. Mint bore and rifling. US sling fits nicely. Stock sanded a bit to relieve some period of use dings but not refinished. Any refurbishing was done through Royal Armories as these were repurposed and upgrades done throughout the century.